Bryony Bainbridge - Violin and Recorder, accompanying 'weaving' harmonies. The sound that we create reflects the musical backgrounds from which we have come; Ruth's being more prominently traditional style, had influence on Bryony's Classical training resulting in a more contemporary sound, yet still true to tradition. We provide a repertoire of original and traditional English and Scottish songs arranged in a contemporary style that is unique to our collaboration. Ruth has released a CD called "Inkwell". More details on her website. 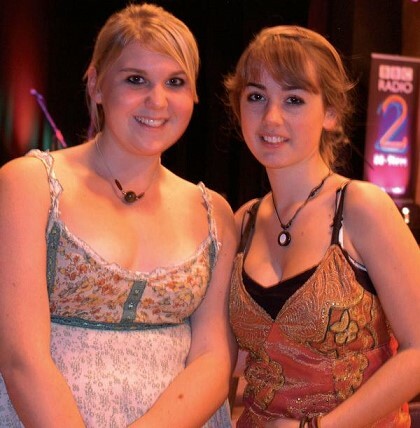 We are a Nottinghamshire based vocal and multi-instrumental duo, and in December 2006 we were finalists for the 2007 BBC Radio 2 young folk awards where we had the great pleasure of performing at London's Union Chapel, after undergoing a semi-final heat in Stratford upon Avon.